The FFIEC (Federal Financial Institutions Examination Council) recommends financial institutions to periodically evaluate information and technology assets including online banking of the organization, threats to those assets, vulnerabilities, existing security controls and processes, and current security standards and requirements. 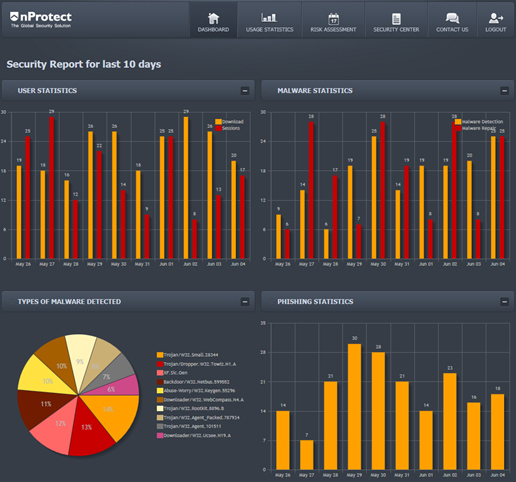 NSRS (nProtect Security Reporting System) provides financial institutions with a risk assessment program for online banking security to identify and analyze information such as User Statistics, Malware Analysis, Phishing Detection, Analysis Request and Security News used to manage risks that threaten the safety of online transactions and FFIEC audits. NSRS provides real-time cloud based threat activity monitoring and reporting of existing and new types of hacking attempts by cyber criminals targeting the financial institution's users. NSRS reports user's online threat information and alert vulnerabilities to the financial institutions to provide users with the safest online transactions while meeting FFIEC requirements. Copyright © nProtect Inc. All rights Reserved.